Select the desired slice size of rough sawn Aromatic Red Cedar, each measuring 12" to 19" in approximate diameter* (at the widest) and 2" in thickness from the drop down “size” menu. We have also recently acquired a laser engraving machine (Yeah!) 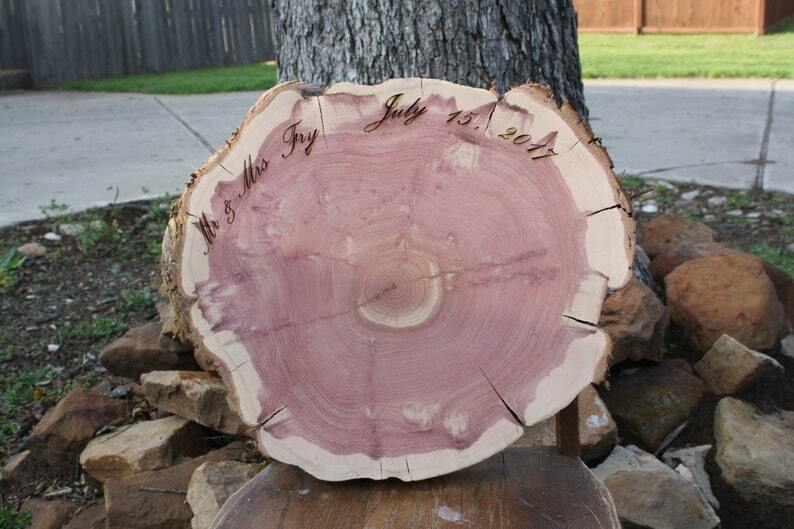 to add custom, personalized messages to our beautiful wood slices. This listing INCLUDES THE LASER ENGRAVING, similar to as shown in photo #1. This will include the names and wedding dates, or a similar amount of text. Longer messages will will quoted separately. *A note about size/measurement: the measurement listed is the approximate size (rounded down to next full inch) across the widest part of the slice. As these are not completely round, it may be less wide at another part of the piece. If you are planning on placing a 12” cake on a 12” slice, you may want to go up a size or 2. Please convo me with any questions. FREE SHIPPING. Local pickup is available, welcome and encouraged. Please convo me for exact location specifics (Central TX). I received it yesterday and I am so excited to have the wedding cake placed on it for the wedding in May. I will send a picture of it then for all to see! It is beautiful, thank you!